A challenger brand is defined not by its size, but by its aim to upend the status quo in its chosen industry. We embrace challengers that aim to deliver both profit and purpose, and recognize the role of business to act in the best interest of society. Want to win? Get in touch. Our name denotes the unconventional tools David used to fell Goliath - 5 stones from a river and a slingshot made of twine. This metaphor guides our approach: we evaluate the strengths of our client and the vulnerabilities of their industry incumbent to uncover our client’s ‘5&Vine'. To successfully take on the Goliath of your industry you need sharp marketing strategy, plans and execution. That said, hiring an entire marketing organization can be a daunting task. With our fractional CMO services, you can scale your company without wasting time and money. Our expert team brings clarity and focus to your brand strategy, consensus among stakeholders on growth KPIs, and the experience and commitment to execute with excellence. Are you an underdog looking to triumph? Engage 5&Vine as your fractional CMO to achieve profitable growth. 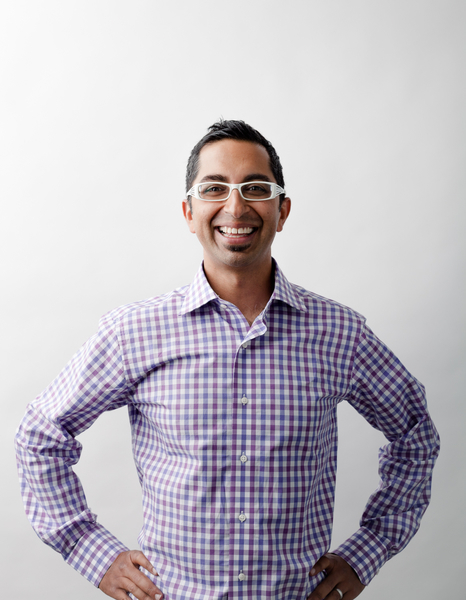 Rahul takes on the role of fractional CMO with 5&Vine clients: from articulating strategy and framing narratives, to hiring and mentoring the marketing team, Rahul firmly embeds himself and manages client budgets and resources as if they were his own. Prior to starting 5&Vine, Rahul helped transform ecobee from relative obscurity to the #2 thermostat brand in North America with a 30% market share and +$100M in sales. Prior to that, he was an intrapreneur at Walmart.com where he conceived of, and developed, a refurbishing infrastructure for US Stores that helped turned costly customer returns into a lucrative revenue stream. For these efforts, he was honored with Walmart's Innovation Champion Award, a fellowship with the Aspen Institute and by GOOD magazine as 1 of 100 people pushing the world forward. Want to be part of a team that's dedicated to work that lies at the intersection of profit and purpose? Shoot us a note. We're eager to collaborate with talented marketers, designers, and developers looking to have a positive impact on the world. Send us a note at careers@5andvine.com.